Cisco Systems is rolling out a host of new and enhanced data centre networking products to bolster the scalability, flexibility and security of its networking fabric. 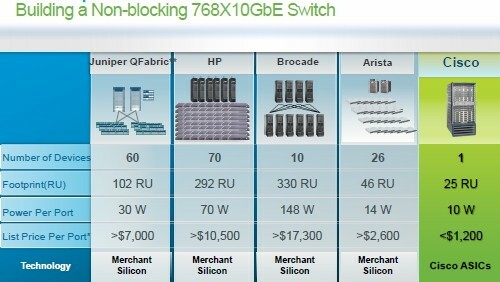 The products, which include the next generation of Cisco’s Nexus 7000 switches, a new Nexus 3000 Ethernet switch and fabric extensions to the vendor’s Nexus 5000 switches, are part of a push by the networking giant to enable enterprises to handle the rapidly growing amount of Internet traffic better. The latest releases are also aimed at giving businesses a networking infrastructure that can scale and handle whatever the workload may be and whether that workload is in a physical, virtual or cloud environment, according to Shashi Kiran, director of marketing for Cisco’s Data Centre Solutions group. “[Enterprises] need the networking layer to be flexible enough to manage whatever application is thrown at them,” Kiran said in an interview with eWEEK. Networking vendors are increasingly pushing network fabrics that offer greater scalability and flexibility in a single architecture that extends beyond the data centre. Rival Juniper Networks offers its QFabric, while Hewlett-Packard earlier this year unveiled its FlexNetwork architecture. Most recently, Enterasys unveiled its OneFabric networking portfolio on 17 October. However, Kiran argued that Cisco is a year or more ahead of its competition in all areas – including scalability and performance – with its United Fabric portfolio, which includes not only the Nexus data centre switches but also the MDS storage switches. The latest enhancements to the switch lineup underscore that lead, he said. The Nexus 7000 series lets IT administrators scale their data centres from a few hundred servers to several thousand, while also addressing demands in such growing areas as cloud computing, and the expanding numbers of devices and mobile workers. A new Fabric 2 module and high-density L2/L3 10GbE F2 Series line card means high performance and reduced power per port of less than 10 watts. Cisco’s Fabric 2 enables switches to scale to 550Gbps (gigabits per second) per slot, more than the 230Gbps capacity found in Fabric 1. With the new capabilities, the Nexus 7000 can stream 4.5 million Netflix movies at the same time, or download in 114 seconds the 250 million photos that are posted each day to Facebook, according to Cisco. The networking giant is predicting huge jumps in Internet traffic over the next few years, growing to 56 exabytes – or about 12.8 billion online movies – by 2013. Data centres are going to have to be able to handle such dramatic traffic growth, according to Cisco. The Nexus 5500 is a top-of-rack switch that offers high 10GbE density and supports Cisco’s FabricPath, which brings greater scalability and helps businesses deal with data centre and cloud workloads that arise from virtualised environments and dynamic mobility scenarios. With the Fabric Extender (FEX) and VM-FEX capabilities, the 5500 can handle thousands of virtual machines with a single point of management. Cisco is also rolling out the Nexus 7009, aimed at mission-critical data centres and campus cores. The switch comes in a compact 14U size and offers high availability and virtualisation support. In addition, the Nexus 3000 switches offer ultra-low latency for such environments as high-frequency trading, high-performance computing, “big data” and Web 2.0 deployments. The company is also offering greater security capabilities for virtualised environments. The latest products come at a time when Cisco officials are refocusing their efforts on the enterprise and their energies on the networking business, which has seen increased competition in recent years from the likes of HP and Juniper. Over past quarters, Cisco executives have pared down the company’s consumer efforts and cut the workforce in efforts to make the company more efficient. The company has become more aggressive in defending its significant market share in switches and routers in the face of the rising competition. The Nexus 7009 chassis has almost as many ports as the larger Nexus 7010 using the new Fabric 2 switch modules – 336 as opposed to 384 – but crams it into 14 rack units instead of 21. Cisco is mounting the seven line cards in the Nexus 7009 horizontally and removing a whole lot of what is apparently extraneous cooling space in the larger Nexus switch chassis. – the Nexus 7009 has side-to-side cooling, which is how it can be packed tighter. The new F2 Series line card has 48 10GE ports that burn less than 9 watts per port, and the Fabric 2 switch modules can deliver 550Gb/sec in switching bandwidth per module, considerably more than the 230Gb/sec in the Fabric 1 modules. You add line cards in the front and switch modules in the rear of the chassis, which can scale between 5 to 11.5 billion packets per second of message handling and between 8.8Tb/sec and 18.7Tb/sec of non-blocked switching capacity, depending on the model, when fully loaded. The new Nexus 7009, which has been shipping quietly since August, costs $20,000. The Fabric 2 modules cost $12,000 a pop for the Nexus 7009 and 7010 chassis and $18,000 for the Nexus 7018 enclosure. These Fabric 2 modules are shipping now for the Nexus 7009 chassis and won’t ship until November for the two larger modular switches. The Nexus 7000 F2-Series I/O modules will ship in November as well, and cost $44,000 each. Those comparisons are for getting 768 ports running at 10GE speeds in a non-blocking manner – Cisco clearly thinks it has a competitive winner. Cisco made a number of other tweaks as part of the Nexus sweep. One was adding a 32MB buffer to its Nexus 2248TP-E switch so it can handle buffering of bursty traffic, such as video streams, better. Another is a promise to make its Adaptive Security Appliance (ASA) firewall appliance, which is sold as a piece of hardware or a plug-in module for Catalyst switches and which has sold over 1 million units to date, available as a virtual appliance. It will be called the ASA 1000V and will complement the Nexus 1000V virtual switch for ESXi hypervisors (and soon Hyper-V) and the Virtual Security Gateway, which came out a year ago as virtual appliance.